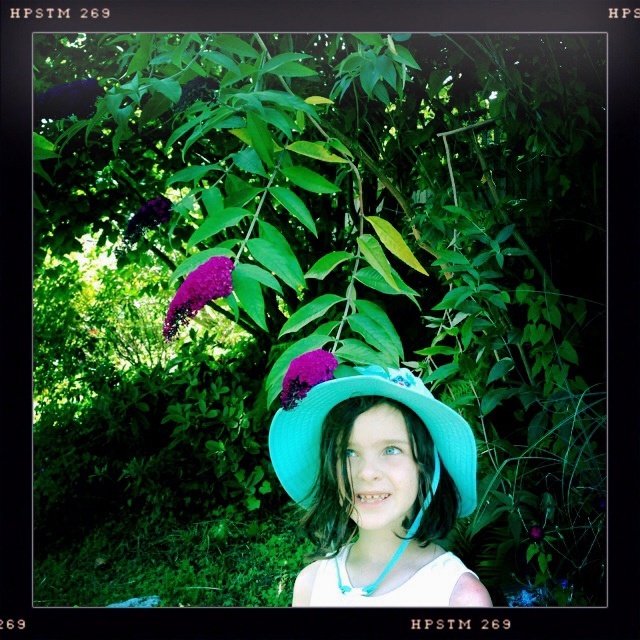 My sweet niece, Sophia checking out the amazing flowers on this Butterfly Bush. July 4th, 2014. Posted as part of Alisa’s Weekly Travel Theme: Purple. Sweet indeed, and with a sparkle in her step. Aw, I’ll share your comment with my sister. 🙂 It’s the perfect time for buddleia! Love that the blue of her eyes almost matches her pretty hat! Good catch, Nancy they do almost match! Thanks, Amy she’s quite a character! What a beautiful, bright eyed young lady. That is also a pretty bush and great shot. My least favorite color but LOVE butterfly bushes and she is a cutie! My husband’s least favorite color too, Tony. 🙂 Glad you like butterfly bushes though! Sophia’s eyes say a lot and pull me in. The purple is nice, too but Sophia is the star!